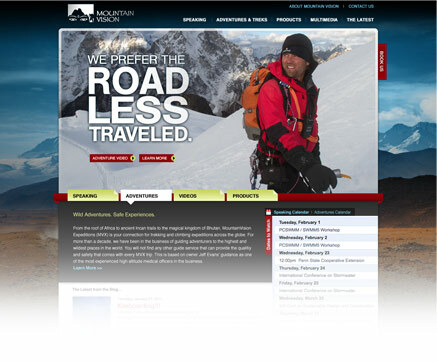 We’re thrilled to announce that Jeff Evans, owner of Mountain Vision, has chosen Ridge Marketing to lead the company’s website rebrand. Evans lives life to the fullest – as expedition leader on ascents up Everest and Kilimanjaro, treks in Machu Picchu, Bhutan and African Safari, and as an inspirational corporate speaker. Evans recently gained the climbing world’s attention by guiding blind climber Erik Weihenmayer up Everest – the first ascent of the famed peak by an unsighted climber. Evans and Weihenmayer are joining forces again this spring, as they compete as one of the teams in Mark Burnett’s new TV series Expedition Impossible, airing on ABC this summer. This combination of Survivor, The Amazing Race and The Mole is sure to test the team’s skills and make for compelling viewing for the rest of us. To establish a creative direction, the Ridge team researched the brands of famed climbers like Ed Viesturs and pro athletes such as Maria Sharapova and Usain Bolt. We’re also drawing upon our own love of outdoor adventure (competitive cycling, snowboarding, waterskiing, cow tipping, etc.) and experience with a local adventure outfitter that had us immersed in premium outdoor brands like Patagonia and Mountain Hardwear.